I know I’ve been super slack on writing these reviews…lets be honest, this cruise happened in 2014 and I am not finished yet! In fact, I have a trip to Las Vegas to review from January 2015 and yet another cruise on the Freedom of the Seas that just happened last week. So I am trying to catch up so I don’t fall so far behind that I forget this latest one! So Day 6. We are in Cozumel, Mexico. Our arrival was delayed due to a medical emergency on Grand Cayman (later found out that it was an older lady suffering from heat stroke!) We have been here before, on the Allure of the Seas, and we just wandered around, found OD a Mexico soccer jersey and hung at Señor Frogs for a while. This time, we have decided to try Nachi Cocum. An all inclusive day resort. 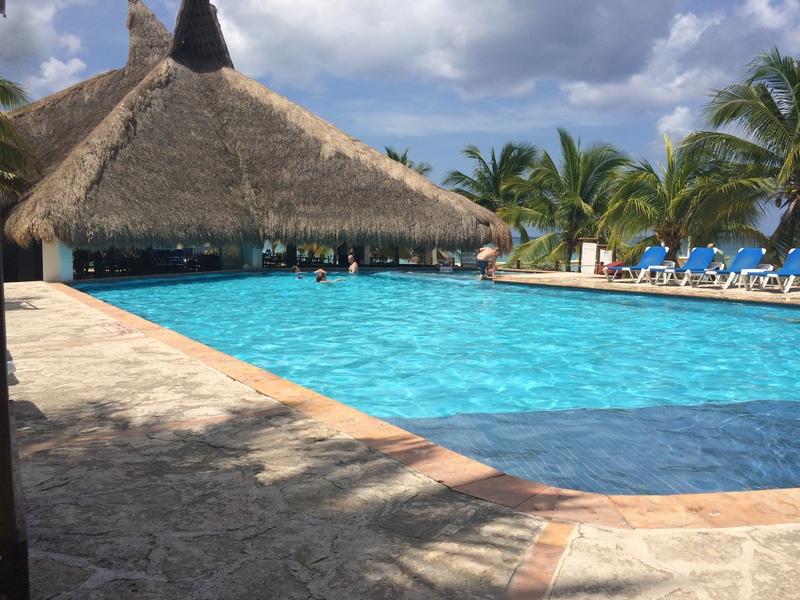 The all inclusive part includes alcohol, food, beach with loungers and palapas, pool and hot tub. 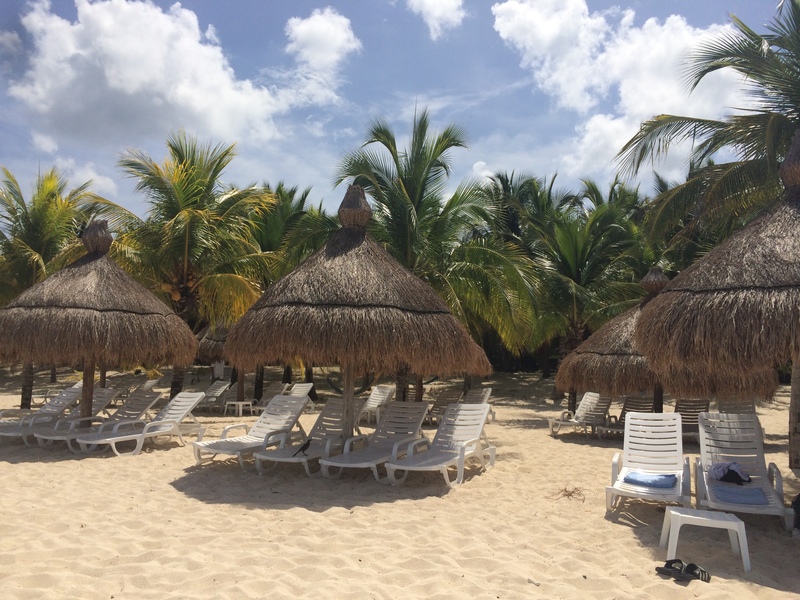 They advertise that they only accept 100 people per day so if you go there, you will not have to deal with the crowds that some of the other day resorts have. Its much quieter so if you are looking for a party, try Mr. Sancho’s, I hear they are fantastic and fun! So after a good nights sleep, we awake refreshed and ready for our day!! And then we stepped into the heat of the day in Cozumel. Oh. My. God. I am fairly sure that one or two of the passengers actually burst into flames. Since we have a 2 year old red-head with us, I was worried about her spontaneously combusting before we could get her in the water, but she made it safely to the cab and we were on our way! After a relatively short taxi ride, we arrive at Nachi Cocum. I think we were the first people there for the day. We were given wristbands color coded based on our drinking ability and shown to our palapas for the day. If you are considering Nachi Cocum, let me tell you, it is absolutely gorgeous! Soft sand, palm trees, gentle ocean…pure paradise. See? Paradise…except Holy Hot!!! 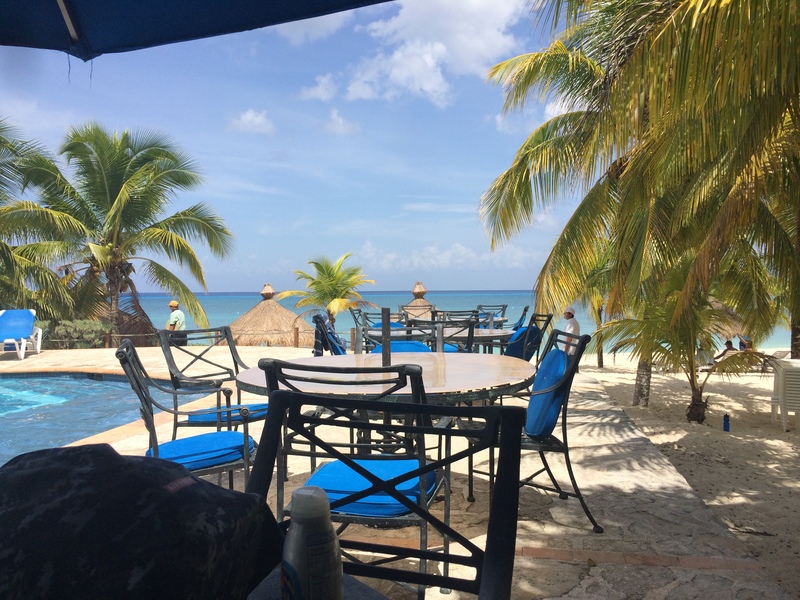 We decided to move up to the pool area, and grab a table under an umbrella…added bonus? Closer to the bar! We had heard about a “signature” drink that they serve in Cozumel, the Dirty Monkey. Basically it is a banana daiquiri with a shot of Kahlua. It is YUMMY! Especially on a day that felt like a thousand degrees, they go down like slurpees! I’m pretty sure we had at least 3 each…before lunch! For lunch, you order off the menu and they bring it out to you. It seems like a buffet would be more likely since it is all you can eat, but the waiters will bring you as much as you care to order all throughout the day. The benefit to this is that the food is hot and fresh and awesome. We had a bit of a bunch of stuff and it was all really good Mexican food! After lunch, the kids mostly wanted to hang in the pool rather than the ocean, so we stayed at our umbrella covered table and enjoyed the day. Both KT and TJ ended up meeting kids close to their ages so that kept them from being bored and whiny! They have a swim up bar and a hot tub as well, although I can’t imagine wanting to be in a hot tub in this heat, some folks did just that. Overall, it was a great day and when we were ready to head back to the boat, they quickly called a cab and had us on our way in plenty of time. Tonight was our final dinner in the Main Dining Room. Our waiters had finally gotten into the swing of things and we really enjoyed our last meal with them. 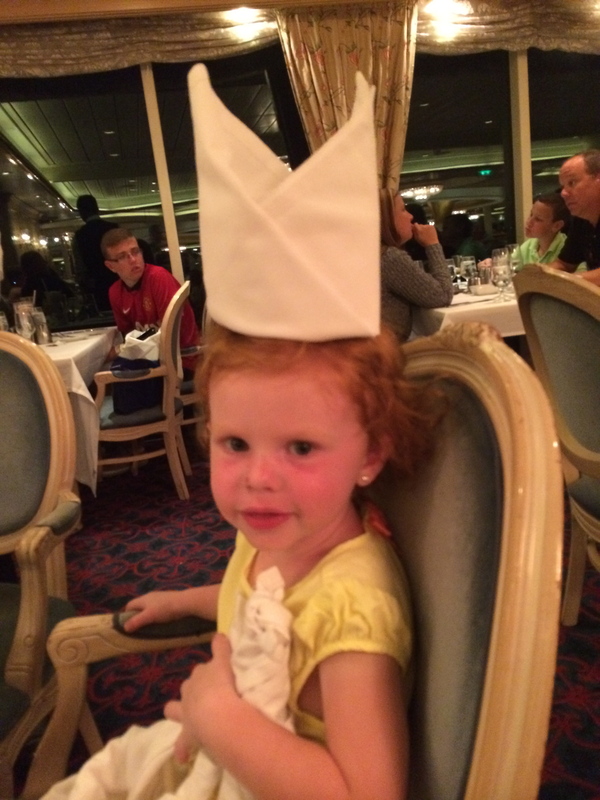 Norbert, our head waiter, has a special talent with napkins and made KT a hat and some sort of napkin animal for our final night. After dinner, we visited the Champagne Bar for a nightcap with Erwina. She had prepared a “Shot Flight” for us to try…as if we hadn’t had enough to drink already! We then headed down to the casino to end our day in Cozumel. Tomorrow is a sea day, and the final full day of our cruise. M & I will be entering the Slot Tournament, P is already qualified and we have our second Portofino’s dinner tomorrow night. Previous postFreedom Sails…Day 5 (cont.)! !